Welcome to Pompilos. The purpose of this site is to spread the book entitled The Nautical Origin of Greek Architecture and Sculpture, which is still in progress. 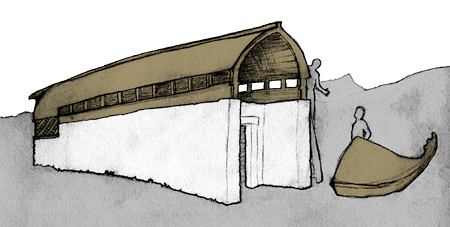 The main thesis of the book, the nautical hypothesis, argues that the Greek temple, and Greek public buildings in general, originated from boats stored and turned over upon supports, with the space under them being used to bivouac, to meet, to banquet and to store gear and commercial products. As the meeting point for the captains of a fleet, ὁ ναὸς οἶκoς (“the arsenal”) became ὁ ναός (“the temple”). On the other hand, the statue of the god venerated in temple originated from the ἱερὰ ἄγκυρα or “sacred anchor”, the one for desperate situations. This anchor was used in naval battles as a throwable weapon (δελφίς), propelled from the top of a pole into the enemies’ boats. Thus it became the ensign of the king, of the fleet and finally of the nation. The naval hypothesis sheds new light on the study of the symbols of the royalty, and so to the study of the classical and other ancient cultures. In the download section I will make the chapters of the book available to download as I finish them. Presumably I will post articles sporadically in the progress section, because my main purpose is writing the book. Vico explica el origen de las clases sociales en el “asilo” o “protección” que daban los nobles a los plebeyos – a los que sin embargo continuaban considerando sus enemigos. Un saludo, y suerte con la web. Dear José M. Ciordia, I just found your website and I would like to congratulate you for your great forthcoming work. Let me give you the most positive feedback I can, in order to help you morally continue your study. Please do let me know when you have something in English to publish on our website and promote your work.